When I think of #BLOTUS, his family and cronies, this quote immediately comes to mind. Never in my lifetime have I witnessed such unmitigated intolerance, lying and corruption focused in the hands of so few and accepted by so many. 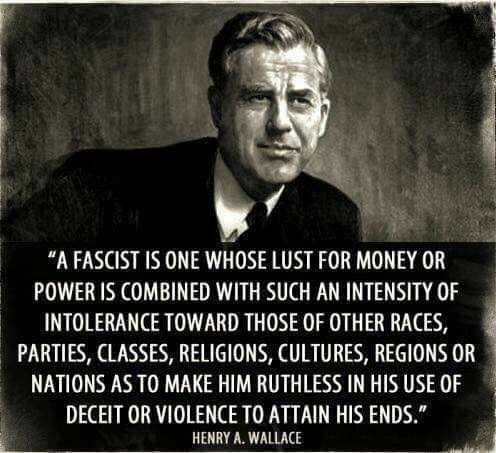 This entry was posted in News & Views, Quotes and tagged acceptance, BLOTUS, classes, cultures, deceit, Fascist, Henry Wallace, intolerance, lust, money wealth, nations, parties, power, quote, race, religions, ruthless, violence on October 16, 2017 by Ray Buchanan.